General tonic for ying and wei qi for preventing illness, recovering from illness, childbirth or surgery and enhancing immunity; general debility, fatigue, postpartum fatigue, poor appetite or digestion due to spleen and stomach deficiency and blood deficiency; deficient wei qi results in low resistance to common cold and other viruses, spontaneous daytime sweating and cold clammy skin; heart deficiency causing palpitations, insomnia and fatigue; spleen tonic for type II diabetes; illness, surgery, childbirth or radiation therapy are some of the imbalances satisfied clients have used this product for. Codonopsis pilosula root, Astragalus membranaceus root, Botanical wax, Talcum. - Dang shen, Huang qi, Botanical wax, Talcum. 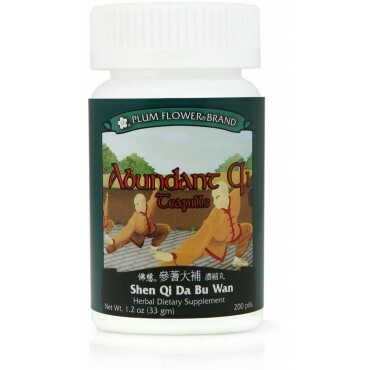 Abundant Qi Teapills - Shen Qi Da Bu Wan is contraindicated during the early stages of acute infection or illness, such as cold or flu.